This article is not a substitute for veterinary advice. Your veterinarian can provide personalized suggestions relevant to your cat’s unique situation. The best cat food for IBD is highly-digestible and helps to heal the gut lining and restore healthy gut flora without placing undue stress on the digestive system. Based on both veterinary research and lay evidence, I’ve identified the top 5 cat foods that appear to have the best chance of reducing your cat’s IBD symptoms and putting them on the road to digestive health. Jablonski’s observations on feline IBD and diet are echoed by others, who argue that IBD is the result of species-inappropriate feeding. The gut microbiome plays a huge part in IBD, and this inner ecosystem is inextricably entangled with what your cat eats. In idiopathic cases of IBD, vets often point to a rift in the relationship between the natural microbiota and the GI immune system—the gut starts to fight against itself, leading to the breakdown of friendly gut bacteria populations and a deformed intestinal lining. As a result of lumenal damage, cats with IBD may develop leaky gut, a condition that permits toxins and bacteria to leach into the bloodstream. It’s an obvious recipe for a cat who constantly feels unwell. Given what we know about the causes of IBD, our goal is to minimize inflammation, support a healthy gut microbiome, and help the GI tract to heal. Prescription foods for IBD or general digestive health follow one of several blueprints. In general, prescription diets are hypoallergenic or novel protein-based. By eliminating or hydrolyzing the components most often implicated in feline food allergies and sensitivities, these foods omit common inflammation triggers and give the digestive tract a chance to heal. Some cats thrive on prescription foods, but it’s important to remember that every case of IBD is unique. Also recall that cats with IBD are still carnivores and, like every other cat on the planet, should receive a species-appropriate, meat-based diet. This means that regardless of veterinarian endorsement, prescription dry foods are still dry foods and seldom offer anything near species-appropriate nutrition. Obviously, neither of these dry foods offer species-appropriate nutrition for an obligate carnivore. Minimally nourishing plant ingredients dwarf the animal inclusions on the list. To add to the oddness of it all, chicken is one of the top cat allergens. When choosing a prescription diet for your cat with IBD, follow the same nutritional compass that should influence all cat food buying decisions. Look for a food that’s rich in animal protein with moderate levels of fat and as few carbohydrates as possible. Of all the diets prescribed to cats with IBD, raw food shows the most promise. It makes sense—we are all programmed to work best when eating a species-appropriate and highly-digestible diet. For cats, that diet consists of raw meat, organs, and bones. A cat can meet all of their dietary requirements by eating raw, fresh prey alone. Anything else—a plant-based diet full of fillers and excess—requires alteration and supplementation before it can come close to satisfying your cat’s needs. A raw diet is the simplest, most straightforward match for your cat’s body. Raw feeding can have many benefits for cats with IBD, but you should be aware of the risks. 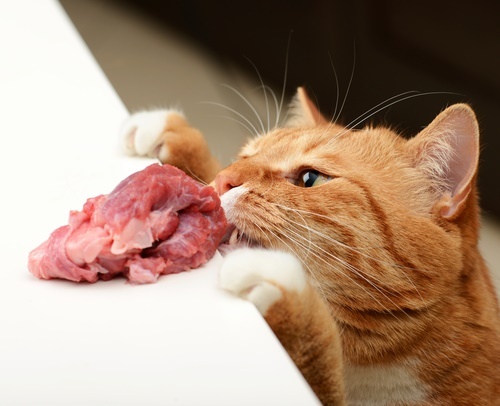 While most cats never get sick from the bacteria found in raw meat, it may be a risk for severely immunocompromised cats. If this worries you, you might opt for home cooked food as a less pathogenic middle ground. Most commercially-available raw foods contain a considerable amount of bone. If your cat has constipation, excessive bone content could make the situation worse. One alternative is to make your own raw food instead, controlling everything that goes into the recipe. This requires careful planning, research, and adherence to well-formulated recipes. Choose foods that are highly-digestible. Because highly-digestible animal protein is expensive, cat food manufacturers like to opt for corn gluten meal, pea protein, and other protein-rich plant ingredients instead. These foods advertise beautiful crude protein percentages, but crude protein doesn’t equal biologically available protein. To nourish your cat with minimal waste and digestive strain, choose a highly-digestible food with healthy doses of animal protein. Cats are obligate carnivores and thrive on animal-based diets. From corn gluten meal to organic butternut squash, fruits and vegetables are neither necessary nor beneficial for any cat. For those with IBD, a species-appropriate diet is even more important. Look for limited ingredient lists and novel proteins. Cats can develop sensitivities to the proteins they eat most often. Since food allergies and intolerances play a part in IBD, it’s a good idea to avoid allergenic ingredients. A few of the most common cat food allergens are chicken, pork, beef, fish, dairy, and eggs. Because meat or animal by-products may contain any variety of allergenic meats, avoid foods that include them. Instead, opt for named proteins. If you don’t know which proteins your cat is sensitive to, select novel proteins that are new to your cat’s diet. If your cat’s always eaten chicken-based foods, choose turkey, lamb, venison, or rabbit instead. If you want to try home-cooked food, but don’t have the time to make your own cat food, you might try this formula from NomNomNow. All ingredients used in NomNomNow recipes are sourced from restaurant suppliers and manufactured in a human-grade kitchen. 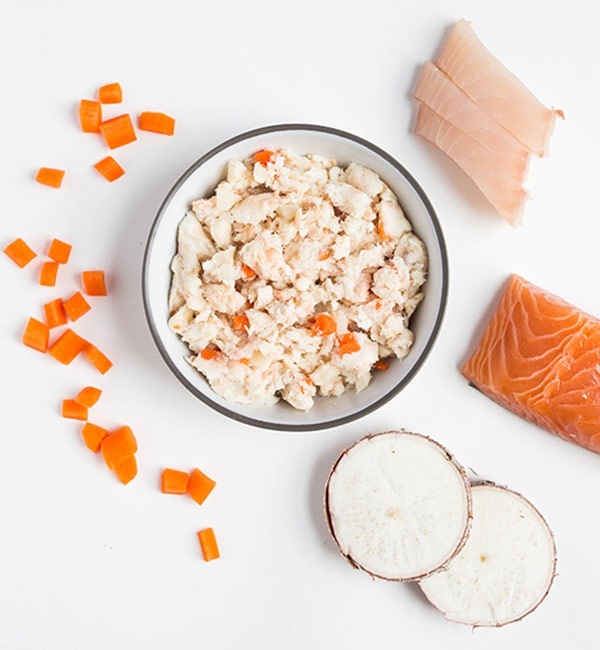 Ideal for cats who are sensitive to everything but fish and seafood, this homemade-style food from NomNomNow is a highly-digestible, meat-based product. Although the recipe contains vegetables, carbohydrates constitute just 5% of the total recipe. Tilapia and salmon are rich in omega-3 fatty acids, which are anti-inflammatory and nourishing for the skin and coat. This food is only available as part of NomNomNow’s weekly or monthly meal delivery service, but if you need to test out the food before making a choice, you can always start with a few sample packets. If the food does work for you, you’ll receive it on a regular basis and won’t have to go to the store to buy it. Price is above market Avg. Get 50% off your first order, which includes samples of all the recipes. If you’re interested in learning more about NomNomNow cat food, and to order, click here to to read our review of NomNomNow. The internet is full of stories from people who say that after trying “everything” on the market, raw food was the only thing that relieved their cat’s IBD symptoms. As the closest approximation of your cat’s natural ancestral diet, a raw diet is a highly-digestible choice that honors their biological needs. 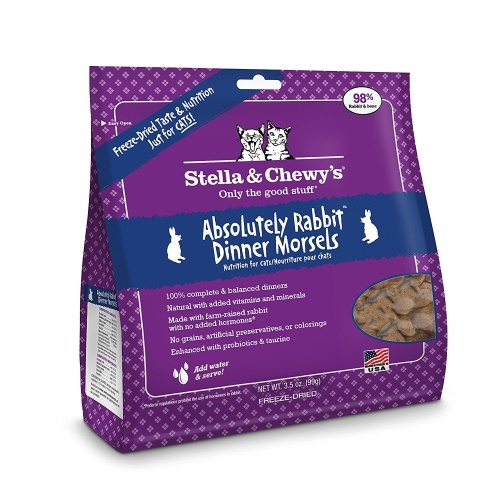 These freeze-dried morsels from Stella & Chewy’s are made primarily from rabbit, which is a novel protein for most cats and unlikely to worsen inflammation. The recipe is free from grains, potatoes, and other high-carbohydrate, minimally-nutritious plant ingredients. 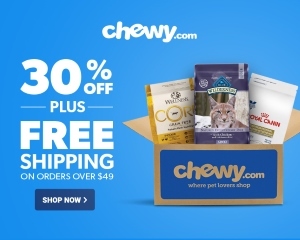 It’s supplemented with probiotics, which can help to fortify the good bacteria in your cat’s gut, improving digestion and potentially minimizing inflammation. 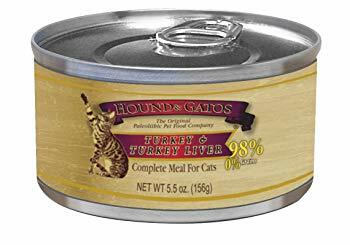 With just one protein source and no grains or other ingredients that could aggravate your cat, this food is a good choice for cats with IBD. Unlike other foods that are loaded with plants, meats, and additives, their canned recipes are just meat, organs, broth, binders, and the supplements necessary for nutritional completeness. The recipe is based on turkey, which is a highly-digestible protein that doesn’t make it onto any lists of the top cat allergens. 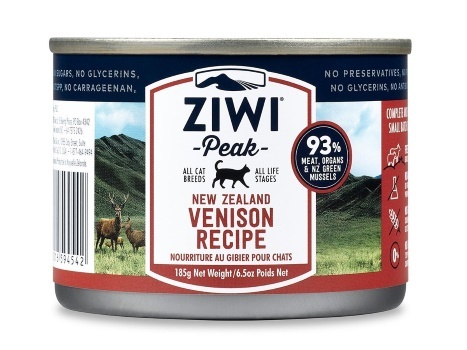 For most cats, venison is a novel protein source and unlikely to spark an allergic reaction. This venison-based food is all about meat, organs, and bones, and doesn’t leave much room for things that could be hard on your cat’s digestion. Animal ingredients constitute 93% of the total recipe. Note, however, that this food does contain chickpeas, which aren’t a nourishing inclusion for cats and might be difficult for some to digest. In addition to necessary vitamins and minerals, the food is supplemented with dried kelp and New Zealand green-lipped mussel. It’s free from potentially irritating artificial colors, flavors, or added sweeteners. This food has several qualities that make it a good choice for cats with IBD. For one, it honors the obligate carnivore dynamic by containing virtually nothing but meat. 96% of the total recipe is turkey muscle meat and turkey liver. The remaining 4% of the recipe is dedicated to low-carbohydrate additives without a history of aggravating inflammation. 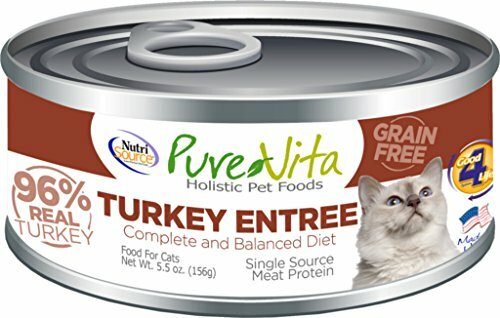 Because it contains a single source of protein, it’s a good choice for cats with suspected allergies or protein sensitivities. And turkey is one of the top meats for cats with IBD. It’s a match for poultry lovers who are sensitive to chicken. In addition to a superb diet, cats with IBD can benefit from certain supplements. Remember that the relationship between bacteria and its host is profound, affecting almost every area of your cat’s health. Relevantly, bacteria is a crucial immunoregulatory agent and can help to control inflammation. Because IBD is fundamentally an inflammatory disease and a condition of dysbiosis, supplementation with “good” bacteria touches at the root of the problem. Click here for our guide to the best probiotics for cats. Because cats with IBD are unable to properly absorb nutrients, most are deficient in vitamin B12. This vitamin can be supplemented via subcutaneous injection. Meat and fish stocks provide the building blocks that can heal the gut lining. Bone broth is mineral-rich and a good source of collagen, which contains two important amino acids (proline and glycine). These help to heal the lining of the gut and reduce intestinal inflammation. Broths also contain glycosaminoglycans or GAGs, which are building blocks for tissue repair. Provide an unseasoned, salt-free broth made from joints, bones, and meat. Because inflammatory bowel disease affects so many cats and their humans, the web is full of resources for anyone struggling to treat their cat’s chronic GI inflammation. 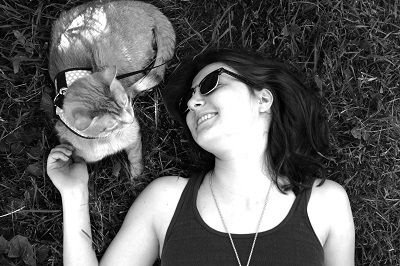 This site is a tremendous resource for anyone who has a cat suffering from IBD. The site features case studies, medication advice, instructions for making your own cat food, and a wealth of information on the condition. If you’re interested in taking the raw route, this website is the GPS that will keep you from getting lost. In addition to strong foundation of personal experience and passion, the site is thick with references to research on IBD in both cats and humans.